AUCKLAND, New Zealand - OFC Champions League carrot drives Auckland City FC's players on according to club legend Ivan Vicelich. The Navy Blues have won an astonishing nine titles since first competing in Oceania's top club competition and remain on course for their eighth consecutive championship if they can scrape past fellow Kiwis Team Wellington over two legs in the upcoming semi-finals. 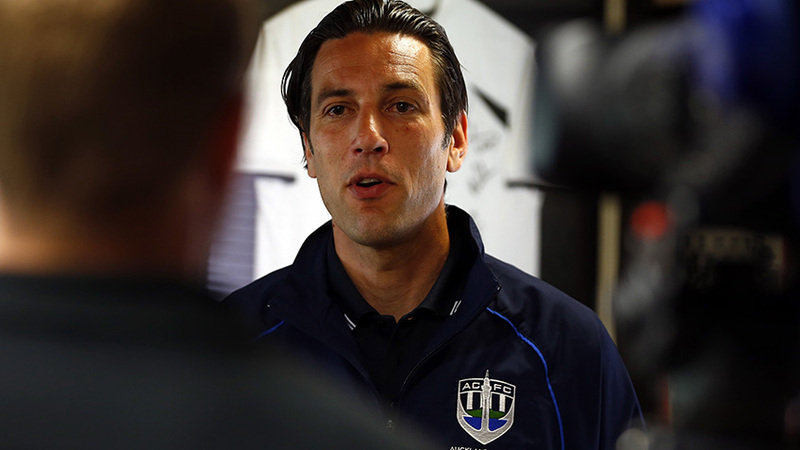 Vicelich, who guided Auckland City FC to five OFC Champions League titles as a player, says the lure of playing in the region's highest competitive level is driving on the Navy Blues players as they chase qualification for another FIFA Club World Cup. All Whites caps Cole Peverley, Cam Howieson, Te Atawhai Hudson-Wihongi, Harshae Raniga, squad stalwart Reid Drake, and the young trio of Dalton Wilkins, Owen Parker-Price, Callum McCowatt, have all played a major role in Auckland City FC reaching the knock-out stages and Vicelich says motivation is at an all-time high. "Cole is a very experienced player and he's played against Auckland City FC in a lot of grand finals - he's just coming into his moment now the Champions League is reaching its climax. "He's done very well in the group, his fitness is good and he's added a lot since he joined us in January. All of the players have stood up to the challenge well. "They've all done very well. In football you need a strong squad with good depth of quality and these guys have all stepped up strongly. Every training session at Auckland City FC is very difficult because the standard is so high. SCHEDULE | Check out the match schedule for the #OFCCL Semi-Finals. All times are local to the host city. "Some of our squad have been hungry for their chance to prove themselves and for some there's been disappointment at not being regularly picked. But when they get their chance they need to grasp it with both hands which they have done. "There's confidence from the coaching staff in all of our players but more importantly there's confidence in the squad, amongst the players, that whoever plays is good enough to perform at a higher level," Vicelich said. Auckland City FC's season has been another rollercoaster ride with the Navy Blues picking up a record seventh ISPS Handa Premiership title. That victory gave the Navy Blues the most national domestic title wins in the history of New Zealand football but the triumph came tinged with an element of angst, at least for Vicelich. "I'm a bit old school when it comes to league titles and for me the team that wins over the course of the regular season, over 18 matches, is the champion. If you win the league, you're the best team. "We've managed to win the regular season title five seasons in a row which is a massive achievement and shows how consistent we've been over a long period of time but that run is underplayed a bit because the playoffs kick in and knock-out matches can be a bit up and down. We've been a bit up and down in the ISPS Handa Premiership knock-out stages over the years. "To me, it was important that we communicated to our players how vital it was they understood what they had achieved because they face a lot of challenges throughout the season. "They play some games in front of 30,000 fans when we tour overseas then we have domestic games, catch-up games and the highs and lows that come with it. "It isn't easy to win the ISPS Handa Premiership, it takes a strong mentality. Our squad has responded well, we've rotated our squad and that rotation has helped develop that consistency. They deserve the accolade but we still have a lot of work left to do in the OFC Champions League. "Auckland City FC is not an easy team to play for because everyone expects you to win all the time and that brings a lot of expectations from people. Its a pressure all of us enjoy as a coaching team and a playing squad."